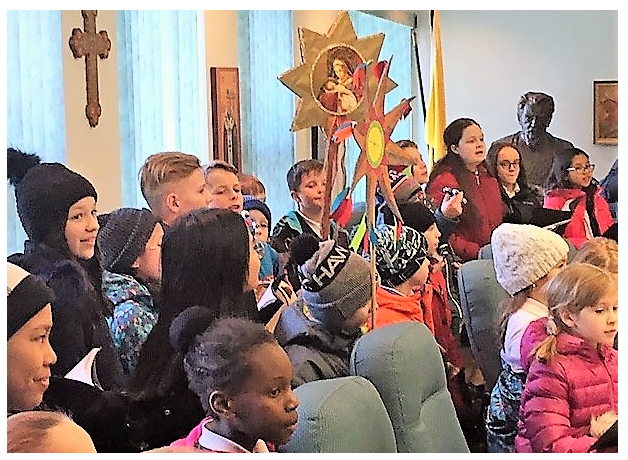 On Wednesday, 16 January, a group of some 30 children from Immaculate Heart of Mary School came to the Chancery to carol for Metropolitan Lawrence. They brought with them the wonderful gift of a rush of laughter, joyful singing and were met with heartfelt hospitality. The group was led by the school's Principal Mr. Rod Picklyk who facilitated the encounter with introductions and explanations. The children were accompanied by the School's music and performance director (and Ukrainian teacher) Mrs. Oksana Stanowych who has become famous in the city for her amazing school stage performances - especially for Ukrainian Week - that seem to engage and bring out the best talents in the entire student body. Metropolitan very much enjoyed the visit and became personally involved in preparations for the gathering days in advance. He welcomed the entire group up to the conference room, greeted the children and listened with obvious delight as they performed for him and the other chancery staff. Some staff members assisted the Metropolitan in hosting the event. 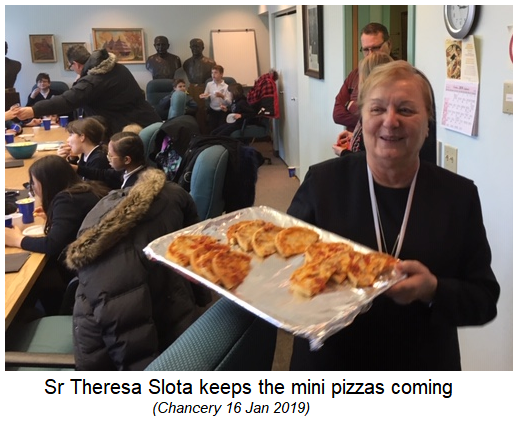 His executive assistance Sr. Theresa Slota, SSMI readied the pizzas. Secretary Subdeacon Walter Dudych welcomed the special guests and made everyone feel at home. (He received a year's supply of enthusiastic "high fives" from the children as they left). 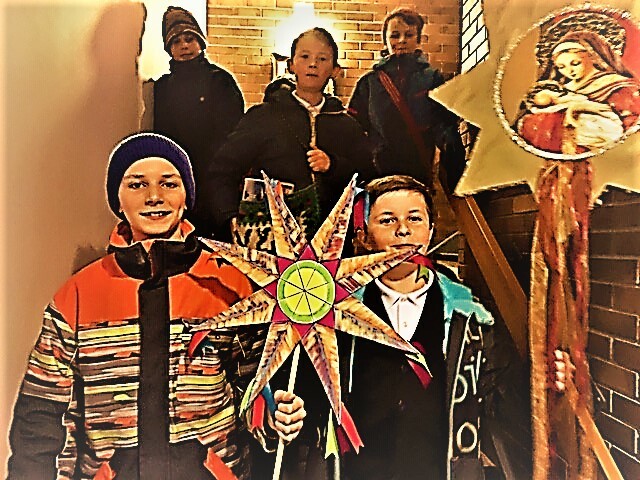 It is customary that various groups and organizations roam the city throughout the post-Christmas season to carol - announcing the glad news of the birth of the Saviour. A number of these groups make their way to the Archbishop of Winnipeg, Metropolitan Lawrence Huculak. 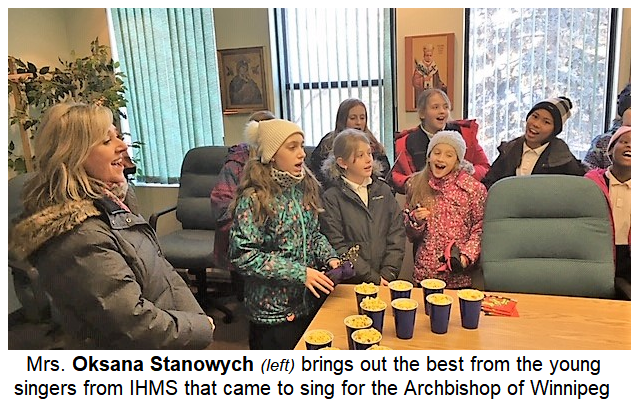 All carollers bring joy, but there is no doubt that the singers from Immaculate Heart School brought a unique and infectious enjoyment to the Metropolitan, to the Chancery and to the whole Archeparchy! НОВА РАДІСТЬ СТАЛА... A NEW HOPE HAS ARISEN...! The School... By The Way... is holding their annual tea on February 3rd! An invitation is extended to all to come and visit the school. While attending the Tea, enjoy the Bake Room and Raffles.